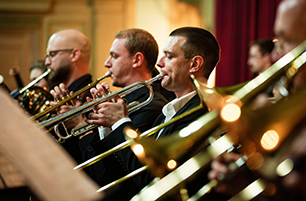 Many of these agreements have resulted in the intense cooperation between partner institutions, and Academy’s students and teachers therefore often have the opportunity to perform on the European musical stage, be members of orchestras and attend seminars taught by first-class pedagogues and musicians. The most significant activities in these areas are: International week organized by KUG Graz, participation in the European orchestra of young musicians, participation at International Summer School Wien (ISA) organized by Vienna Music Academy. Academy of Music is frequently the host of international scientific meetings and conferences, the most important one being the Musicological Symposium organized by Academy of Music and Musicological Society, as well as by Institute of Musicology and Ethnomusicology, which is one of units of Music Academy in Sarajevo and the organizer if international artists’ concerts. A very significant form of work in this area is the establishment of Sarajevo Chamber Music Festival, in the cooperation with the famous Manhattan String Quartet, which our audiences have enjoyed four times so far! Our professors give concerts across Europe, teach at the institutions we cooperate with, are members of juries at international competitions and teachers at seminars beyond BiH. Academy of Music in Sarajevo is a member of European umbrella organization of higher-education music institutions – AEC. Membership in this organization has greatly helped our work and desire that Academy be recognized as a high-quality institution of European level, desirable for international students and partners from other music academies and conservatories. 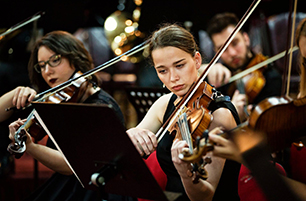 Academy students regularly participate in the work of the European Student Chamber Orchestra, an orchestra formed of the best young artists from 22 academies, participate at prestigious courses and summer schools, such as ISA Vienna, and perform at various events organized by partner academies. Besides, Academy of Music in Sarajevo is often the host of visiting professors who come from partner institutions. We also frequently organize gatherings and meetings of partner institutions’ representatives, with whom we agree about plans for future cooperation. Erasmus+ academic exchange programs are accessible for our students through university and institutional contracts. Among the numerous projects we have implemented, the most important are “Widening participation on the road to membership”, funded by SIDA, and Tempus project “Introducing multidisciplinarity in music education”. Sarajevo music academy has a very good cooperation with various educational, artistic and scientific associations (SIAD of Sweden, MwB of the Netherlands, Goethe Institute of Sarajevo, Red Oak of Dayton, etc. ).